For over 20 years, Traffic Displays, LLC has been providing the best looking and most well maintained fleet of Mobile Billboards Nationwide. 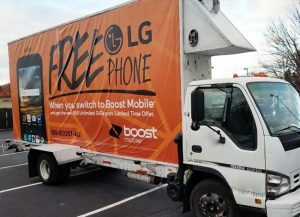 This fall, we had the privilage of running a Mobile Billboard campaign for Boost Mobile and ran into some of our competition running the exact same advertisment. Can you see the difference? Which would you choose? At Traffic Displays we guarentee that your advertisment will be presented in the most professional way possible. Here are just a few of the reasons we are the number one choice for Mobile Billboard campaigns. 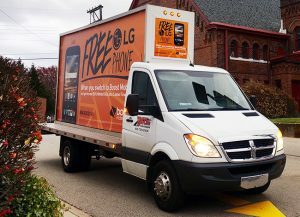 We have the newest fleet of Mobile Billboards in the industry with all of our vehicles being model year 2012 or newer. We fabricate every sign body and flatbed in house with the highest quality materials and finishes. Our Mobile Billboard trucks are detailed at the return of every campaign, ensuring they maintain their clean and professional look throughout your campaign. Our uniformed employees are the best in the business and will get your Mobile Billlboard in front of the right crowds with a positive and friendly attitude. In our industry we know that our vehicles directly represent you and your company, don’t you want your advertisment to look the best it possibly can? Because we do! Call 616-225-8865 to learn about Going Mobile with Traffic Displays.